The reason why you’d want to consider doing this is where part of your formula always needs to refer to the same row or column; in its simplest case this could be to set up a “Times Table” or an invoice where you want to apply the same VAT Rate. To do this, we use the dollar sign ($) in our Excel formula. In each case it is changing the reference to refer to the cell one to the left on the same row as the cell that the formula is in, i.e. the same relative position that A1 was to the original formula. The reason an error is returned when it is pasted into column A, is because there are no columns to the left of column A. 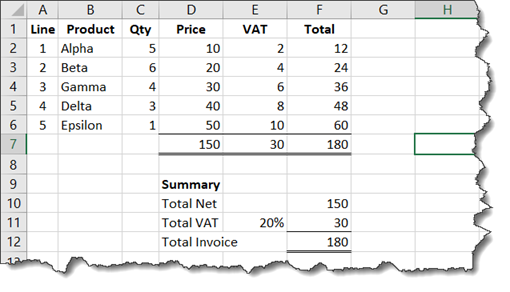 This behaviour is very useful and is what allows a sum to be copied across or down the page and automatically refer to the new column or row that it finds itself in; as I’ve mentioned, this is Excel’s default behaviour. However, as noted above there will be some situations, you want some or all of the references to remain fixed when they are copied elsewhere. This is where the dollar sign ($) is used. This is where only part of the cell reference is fixed using the dollar sign. If you want to fix the column, the “$” goes to the left (or in front) of the column letter; to fix the row, it goes to the left (or in front) of the row number. So, if we always want to refer to row 1 when copying a formula down, we use, for example, “=B$1” and “=$A2” will always refer to column A. If we’d not used the $ sign appropriately & had the first formula in cell B2 as =A2*B1, we’d have ended up with a far different result! The strange numbers towards the bottom & right of the table are in Scientific Notation – in F6 it means 6.37 x 10 42 times! Somewhat larger than the 25 that we were expecting! This entry was written by colinfoster, posted on May 8, 2018 at 5:17 pm, filed under Microsoft Excel, Tips and Tricks and tagged Absolute cell references, Excel, Mixed cell references, Relative cell references, Spreadsheet. Bookmark the permalink. Follow any comments here with the RSS feed for this post. Comments are closed, but you can leave a trackback: Trackback URL.